There is one significant disadvantage to learning spiritual practices and disciplines from the likes of Thomas Merton. While Merton hid out in an abandoned tool shed to pray each day or ventured off to his hermitage for days at a time, most of us can hardly string together 10 minutes of silent prayer before an inevitable interruption comes along. It’s easy to become discouraged when comparing our time for prayer to someone who dedicated large blocks of time to it. I can get caught up in the challenges of pursuing solitude in a family of five in a relatively smallish house with thin doors and bedrooms clustered closely together. Even if I carefully plan my time, a child will pee on something other than a toilet, the pharmacy will take longer on a prescription, extra homework will show up unbidden, or a work project will take hours longer than anticipated. These aren’t things that can generally be put off until later, and so plans and disciplines need to be adapted or dropped for the day. The perfect version of a spiritual practice isn’t a guarantee most days for a parent, and it’s not like Thomas Merton has a wealth of experience in this department, even if he frequently complained about how busy the monastery kept him. This week I was practicing silent breathing and centering prayer while driving around town. That’s not the ideal situation for that practice, but it’s the time I had while navigating an unexpectedly full schedule. At another point, I was praying the divine hours in the pharmacy pickup line. That’s not my preferred place to pray the hours, but it was better than not praying them at all. It’s easy to turn to our phones for podcasts, social media updates, emails, text messages, or videos to pass the time. What can you do with five minutes in the pharmacy line? What good will ten minutes of imperfect silence in the car really do for you? What I’ve found is that doing spiritual practices imperfectly is still better than not doing them at all. When anxiety, sloth, and lack of discipline show up in my life, I can always trace them back to a schedule that filled up and completely crowded out spiritual practices like praying the hours or centering prayer in silence. By hanging on to these imperfect practices, I kept myself somewhat stable and maintained the habit of making space for them. On the following day I wasn’t juggling a mountain of unexpected projects, and so I could maintain a certain level of continuity with my spiritual practices. I still wouldn’t say that they were on par with the quality of Merton’s reflections in the hermitage, but of course he would scold me for even suggesting that one person’s contemplative practices could be compared to another. Perhaps that is the most significant reason to accept “imperfect” spiritual practices in the first place. I write books about Christianity, prayer, and spiritual practices, so you could say that my books could be considered religious goods in a consumer society. When I sit down to write these books, I’m always trying to think of ways I can minister to and help my readers. However, drawing a line between helping readers and telling them what they want to hear can prove challenging to authors. Abundance and joy is preceded by a surrender or death to certain priorities or ways of living. Abundance and joy rarely look the way we imagine they will look. These are all results that come over time in contemplative prayer, but they are not necessarily guaranteed, especially in the short term. Contemplative prayer can offer a deeper, more foundational fix to these issues by addressing them as part of the larger picture of prayer, identity, and surrender. When Jesus spoke of the life he offered, he certainly used terms that we would associate with abundance–springs gushing with water or trees that are plentiful with fruit. He also warned that our lives must go into the ground and experience a kind of “death” in order to produce fruit. There really isn’t a program other than surrender and sacrifice to a loving but unseen God. It’s not easy, and oftentimes it’s counterintuitive to wait in silent expectation. The sales pitch, to use consumer language, for contemplative prayer is summed up more or less in the word surrender. It’s much easier to add something than to give something up! That’s what makes consumerism so powerful. When Thomas Merton shared the writings of John of the Cross or Teresa of Avila, both offer a demanding path forward that involves sacrifice, discipline, and purity of heart. Yes, they wrote of the deep love of God for us, but they also oriented their lives around this pursuit. We need contemplative prayer because it offers a simple yet structured way to become present for God each day. Silence and resistance to distracting or afflicting thoughts through a prayer word can open up a space for God that we didn’t even know we could find. Arriving at this point is hardly easy going. It’s costly. It’s a leap of faith. It calls for the disciplined pursuit of God through surrender and silence. Far from providing yet another spiritual good or service to acquire, contemplative prayer in silence before God will challenge us to surrender what we have. Our hope is that what God gives us in return will far exceed the worth of whatever we can purchase on our own. Do I Pray for the Wrong Reasons? Am I doing this contemplative prayer thing right? Do I have good results from my prayer? Do I have a greater sense of God’s presence? Present throughout all of these questions is the lingering false self that seeks an outward marker of identity. Even becoming someone who prays, and prays well, can become a kind of false identity marker. 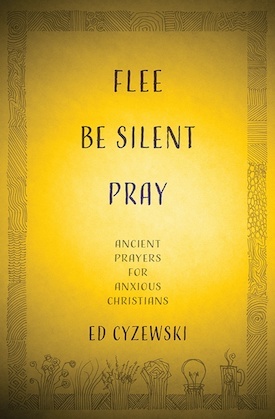 I write in my book Flee, Be Silent, Pray that American evangelicals like myself are especially driven by results and outcomes. What can you measure? What can you point at to validate your work or practices? This mentality creeps into a kind of success-driven approach to spirituality. Thankfully, Thomas Merton is on the case. He cuts through our misguided motivations. Rather than offering one slick promise to replace another, he points us into the direction of mystery and complete faith in God. This isn’t a spirituality that dangles the hope of discovering purpose, living a super story, or even finding peace. Merton points us to mystery so that we can live out of our authentic identity in God as his beloved children. Perhaps we will find some of those things after they have been pried out of our hands and we learn to cling to Christ alone, but those are afterthoughts rather than the focus. Thomas Merton. The Inner Experience: Notes on Contemplation, p. 2.